The most palpable effect of "The Artist," Michel Hazanavicius' beautiful homage to the tail end of the silent cinema era and movie-making's uneasy transition to talkies, is that it makes the audience member acutely attuned to their sense of hearing. I don't think my ears have ever listened so intently at a cinema until I caught the film at CineArts in Palo Alto last night. This might seem counterintuitive -- "The Artist" is almost shot entirely as a silent film, with title cards used to describe key moments of dialogue. Yet because of the lack of conventional dialogue, every sound both on screen and off pops like the heavy makeup around a silent move star's eyes. Ludovic Bource's lush musical score, which evokes the era represented in the film without pandering to cliche, underscores key moments thrillingly and emotionally. And when Hazanavicius uses sound effects at two key points during the story, the sound has the effect of taking us (as well as the characters on screen) completely by surprise. It's a masterful use of audio both as a means of story development and metaphor. Beyond the movie's brilliant use of audio, I was also very taken by how many sounds I picked up around me in the cinema. Usually I don't notice rustling popcorn containers, coughing or whispering unless these sounds are happening in a very persistent and loud way in my near vicinity. 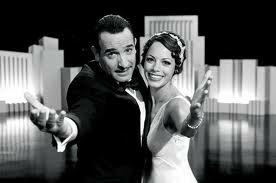 But while watching "The Artist," every tiny environmental sound came to my attention. The weird thing was, that far from being distracting, these sounds somehow made the movie-going experience more palpable: "The Artist" is all about the visceral relationship between cinema and audience and as a result of the film's unusual use of sound, the connection seemed all the stronger. P.S. The movie is also a lot of fun. It made me want to rush out and acquire a pair of tap show and a terrier.